Collection of more than 1,000 chosen Indian recipes. Not only Indian cuisine, but the country of India itself, is well known for its use of spices which add exciting flavors to many dishes. With its many regions, languages and religons (many of which have dietary requirements such as vegetarianism), there is also a great variety of styles in Indian cooking. Dhokla - This dish is originally from Gujarat in the West of India. It is a kind of spicy-savory cake made from chickpea paste, which is served with green chutney or peanut oil. Dosa - A large thin pancake from South India. It is made from rice and lentils, and usually eaten with chutney, pickles, or sambar (a vegetable stew flavored with tamarind). In non-vegetarian households, dosa are sometimes eaten with chicken or mutton curry. Kheer - A rice pudding made by boiling rice with milk and sugar. Softened almonds or pistachio nuts are often added, and the dish is often flavored with cardamoms and saffron. In South India, the dish is known as payasam and is made using coconut milk instead of milk. Murgh makhani (butter chicken) - Originally from the Punjab, this dish consists of chicken marinated in yoghurt and spices, then grilled or roasted. 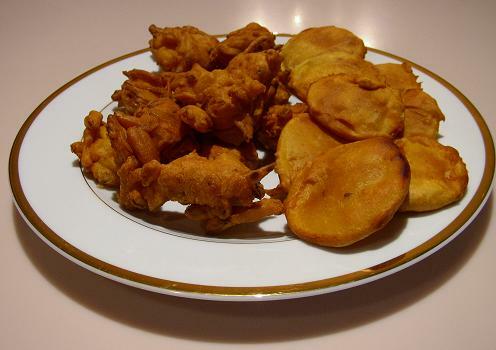 Pakora - Vegetables (cauliflower, chilli, eggplant, onion, potato, spinach or tomato) or cheese (paneer) coated with gram flour (flour made from chickpeas) and deep-fried. They are a popular snack. Pani puri - A crispy puri (made from fried dough) filled with a watery spicy mixture containing chickpeas, potato, and spices. Patra - This vegetarian dish from Gujarat is made from rolled up Taro plant leaves with spices and tamarind paste which are then sliced and fried. Ready prepared patra is available in tins. Phall - A very spicy hot South Indian curry dish. Samosa - A popular North Indian snack. It is made from pastry shell, usually triangular in shape, and is filled with mashed potato, or sometimes cheese (paneer), chickpeas, ground meat, or mushroom (khumbi). Tandoori chicken - A chicken recipe originally from the Punjab. Tandoori chicken is prepared by marinating chicken in yoghurt and tandoori massala (a mix of spices). It is traditionally cooked in a clay oven (tandoor), but can also be grilled. Vindaloo - A Portuguese influenced curry dish from Goa (which was colonized by Portugal). It is very spicy hot and has become a popular Indian dish in Britain, Australia, and New Zealand. In Goa itself, vindaloo is usually made from pork, but overseas, other meats such as chicken are often used. The Secret to perfect Homemade Indian food... Learn the ancient secrets... In Less than 10 steps, every time! Love Curry But Worried About What Eating It Will Do To Your Waistline? Worry No More! Here�s 90 Delicious and Highly Nutritious Curry Recipes That Not Only Taste Fantastic But That You Can Actually Eat While Following Dax Moy�s Elimination Diet!